NO MSG, Gluten-Free & Vegan. Special Seasonings, Spices & Salts. 6 Bloody Mary To Go Cups. Lids and Straws. Now Take your Bloody with you! NO MSG, NO Chemicals, Vegan, Gluten-Free, Non-Perishable and Natural Ingredients including Horseradish and Worcestershire. 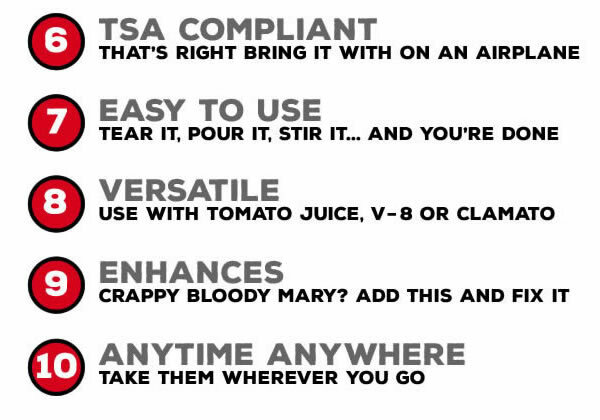 Simply add to your favorite tomato juice, V-8® or Clamato® juice and vodka. 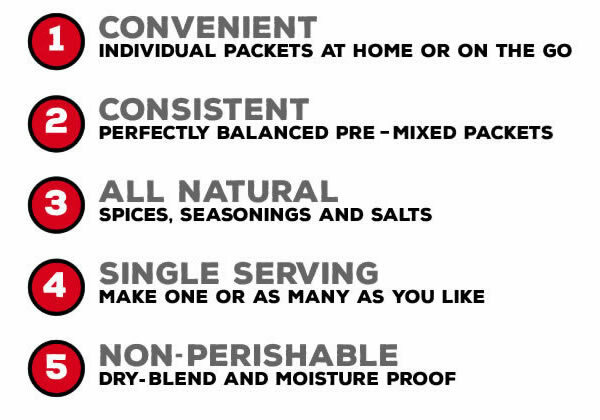 Either at home or on the go, on a train, in a plane, at a bar, from afar, on a boat or with a goat, now simply take the convenient seasoning mix with you. These little packets are completely sealed and ready to use. Enjoy the best tasting Bloody Mary Every Time, Anytime. 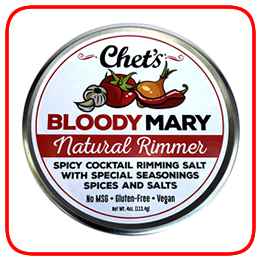 Chet’s Bloody Mary Seasoning Mix has been created with combinations of natural spices and salts. Celery Salt, Worcestershire Powder, Garlic Powder, Paprika, Sumac, Black Pepper, Red Pepper Flakes, Cayenne Pepper, Horseradish Powder and Parsley Flakes. Adding just the right amount results in a Bloody Mary Seasoning Mix bursting with flavor. What makes a great Bloody Mary? Is it the Ingredients? Is it the Consistency? or could it also be the Convenience? Trying to find a perfect balance is where we struggled the most. That’s why we came up with a solution. 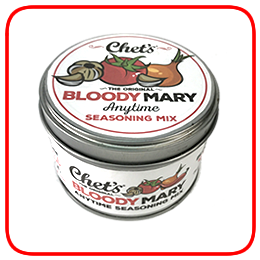 Chet’s Anytime Bloody Mary Seasoning Mix. Now you get the Convenience of the Best Tasting Bloody Mary Every Time Anytime. 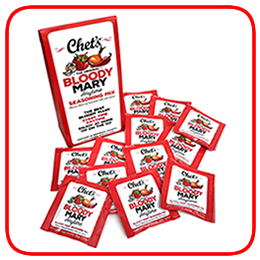 Watch our Video about Chet’s Anytime Bloody Mary Seasoning Mix.